We use this compost tea recipe on the farm for starting seeds, 'watering-in' transplants, and to give an organic boost to our plants in the garden. Good compost tea starts with good compost. You can use compost made from any plant-based organic material e.g. leaves, kitchen scraps, garden waste, grass clippings, straw, old hay etc. CAUTION: animal manures can carry harmful e. coli bacteria. We suggest you not use animal manure in the compost for this compost tea recipe. You can also use worm castings in your compost tea, if you have a worm bin or can buy worm castings from your garden supply store. 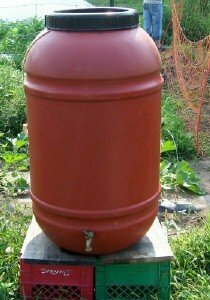 Set your compost tea barrel up securely, start filling it with water. As it fills, dump your compost onto a section of row cover, and wrap and tie it with strong twine or rope. Make sure to leave a 'tail' of rope long enough to retrieve the bundle of compost from the barrel. Fill the barrel nearly full with water, then drop in the bundle of compost. Make sure to keep one end of the rope out of the barrel. Molasses can be added to the compost tea to encourage the growth of beneficial bacteria. Epsom salts can be added to provide additional magnesium, especially good for flowering plants. Kelp or alfalfa meal can be added to provide a rich assortment of micro-nutrients.